Tucked into the tall pines of the Yellowstone Club there will be a home design based on form and function for views of the land. The exterior forms of this home will be composed of several building types – utility, tower, farm, and bridge – that will combine to create a structure designed to fit the land. A few of the requirements important to our clients were views, entertainment and seclusion for the family. Angles were introduced into the floor plan to capture specific views and to conform to the land creating excitement and unique elevations on the exterior. To conform to the existing bench that is present at this site, we broke the back of the garage structure to reduce the scale of the building, giving the effect of two buildings. The location of the Entry, which will be at the front of the Great Room, has been a point of thought as to how it will flow with circulation. When you enter, you will be greeted by an Inglenook made of large amounts of stone containing a small fireplace. 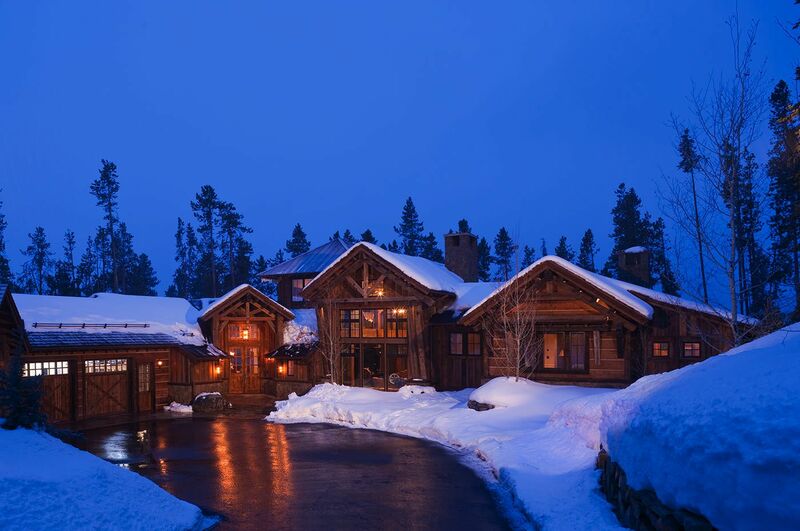 Once you have entered, you will experience the expansive views of Pioneer Peak and the Yellowstone Club ski runs. The Great Room/Kitchen area is the base of the design for this home, an open area concept located in the center of the main floor plan. Monolithic stone spires and “clean” burnt timbers will repeat throughout the home. From the Great Room, the space flows to the private Master Core or to the Kitchen/Hearth Area. Fireplaces are used as focal points in the interior spaces. The massive stone fireplace with delicate steel and copper detailing that is located in the Great Room will create a sense of permanence. Detail throughout will have emphasis on steel connectors, timber trusses, fascia profiles, roof materials, finishes, trim for windows and doors, and custom door designs. The exterior cladding will be historic ‘clean” burnt wood timbers, metals of steel and copper, glazing, and stone. Several planking styles will be used to resemble historical farm framing techniques and design. Our design allows the natural light to reach far into the interior spaces to lighten the feel of the architecture and to create a dance of shadow on the interior. Custom lighting will accentuate the structure at night to create a subtle old time feel.